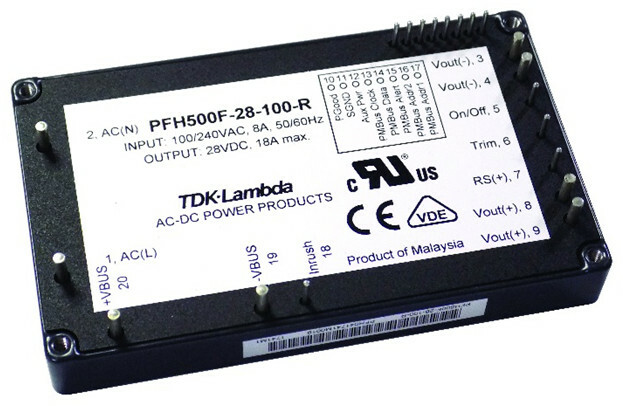 Within the TDK-Lambda-branded PFH500F‑28, a pair of GaN transistors have been used in a ‘bridge-less’ front-end power factor correction stage, raising efficiency in the PFC stage to 98.6% and peak efficiency of the over-all supply to 92% peak. According to marketing director Martin Southam, this is the first time the firm has used GaN components in an ac-dc PSU. He also said that the PFC stage could have been 0.4% more efficient – to 99% – at the expense of two more GaN transistors to make a full bridge, but cost-benefit analysis showed this was not the optimum solution for the intended markets. The GaN transistors provide active rectification as well as high-speed switching for the boost topology PFC. “You can’t use silicon mosfets there because their large reverse recovery charge is problematic,” Southam told Electronics Weekly. The GaN components are from Transphorm. “We chose them based on demonstrated reliability data,” said Southam, adding that the PFC stage is based on a Transphorm reference design. Also for reliability, traditional optocoupler feedback across the input-to-output isolation barrier has been replaced with a digital isolator. Operating from 85 to 265Vac, the power supply can deliver 18A at 28V, and can be adjusted for outputs across 22.4-33.6V via its trim pin or its PMBus control bus. Other output voltages will be available later this year. The module, which is 13.5mm high, is baseplate cooled and will operate on baseplates from -40°C to +100°C. “The PFH500F series has been designed for outstanding performance in commercial-off-the-shelf, LED signage, communications, broadcast, test and measurement,” said TDK. Features and options include droop-mode current share, a 12V auxiliary stand-by output, remote on/off, remote sense and an open-collector power good signal. Its PMBus can be used to program the output voltage, activate the remote on/off, change the under-voltage, over-voltage, over-current and over-temperature set points, plus read-back input and output current, input voltage and internal temperature. Input to output isolation is 3,000Vac, input-to-case is 2,500Vac, and output to case is 1,500Vdc. Safety certification is to IEC/EN/UL 60950-1, with CE marking for the Low Voltage and RoHS2 Directives.